In many cases a performer will try his or her best to imitate a celebrity . . . .not Frank Grata. 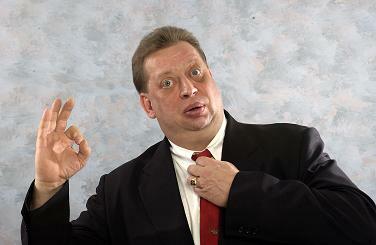 Frank not only looks like Rodney Dangerfield, he walks like him, has the same mannerisms and even sounds like Rodney. His style is natural, nothing is phony or forced . . . he is Dangerfield�s clone. Grata mixes his own material with many of Dangerfield�s famous bits. �Some people were born with silver spoons in their mouths, not me, I was born with a silver foot in mine,� Rodney (er� Frank) says as he adjusts his tie. Frank Grata�s natural looks combined with his talent and professionalism have taken him all over the country. He has played clubs, colleges, casinos and corporate events. He was the grand prize winner in every look-alike contest he enters. Grata once netted a trip to Hollywood by beating out over 60 impressionists and impersonators.